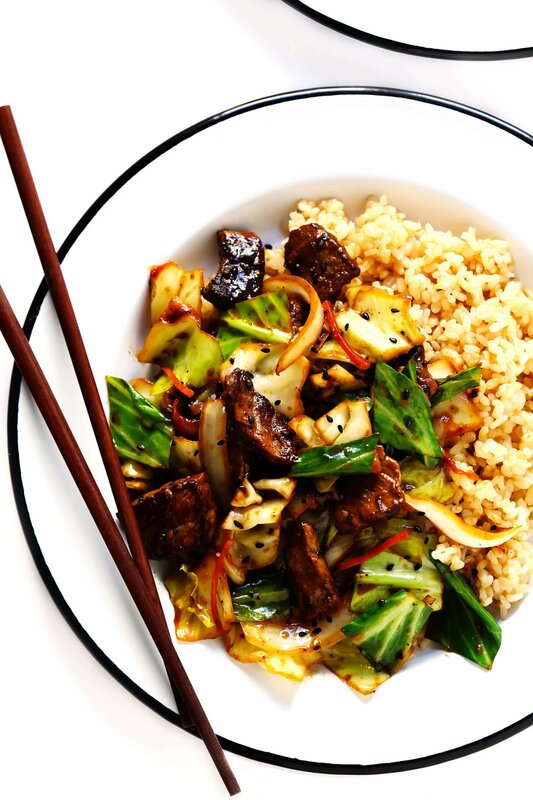 This Sesame Beef and Cabbage Stir-Fry recipe is quick and easy to make, tossed with a sesame ginger stir-fry sauce, and absolutely delicious! Meal prep tips included too. 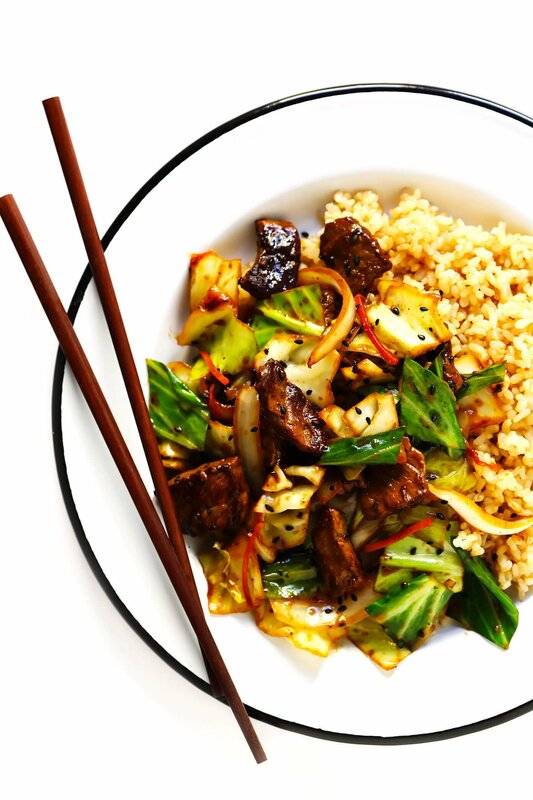 Beef (stir-fry)…it’s what’s for dinner! Now that Barclay has switched to officing out of a coworking space here in Barcelona, I’m back on my own here for lunches again. So I’ve been getting back into the meal planning groove to try and prep some healthy meals each weekend for the week ahead. And now that I’m back to just cooking for myself, I’ll be the first to admit that the very first ingredient I reached for at the store without even thinking was — yep — a nice, juicy, organic steak. Ha, I promise that I genuinely have been content switching to a mostly plant-based diet ever since I married this vegetarian husband of mine. But every now and then, this Midwestern girl still misses her steak!! 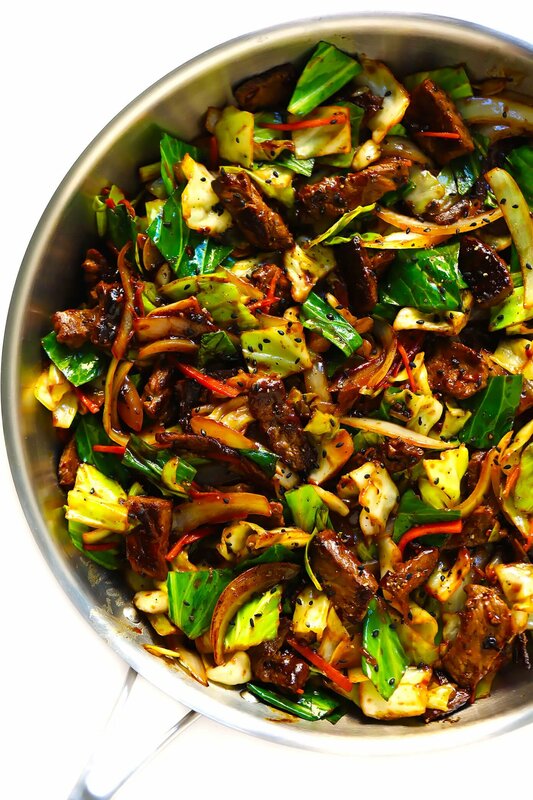 Sure enough, this beef stir-fry totally hit the spot. It’s loaded up with tons of cabbage, which keeps the dish feeling nice and light and not too heavy. 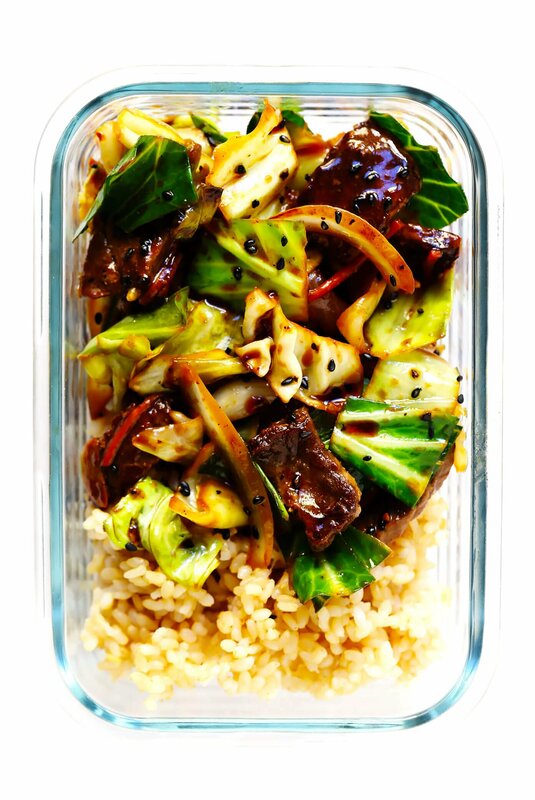 It’s tossed in a yummy sesame ginger sauce, which you can double if you would like the stir-fry to be extra saucy. It can be served up with rice, noodles, quinoa or any other grains that you prefer, or it can also stand solo. It’ll be ready to go in just 30 minutes, making it perfect for meal prep or a quick weeknight dinner. And best of all — it’s absolutely delicious. 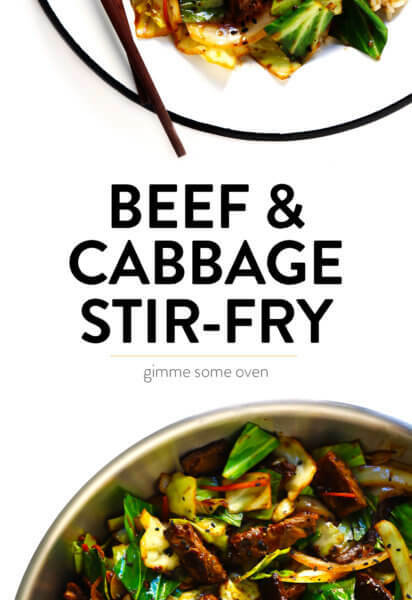 So for any of you out there who also might have a steak craving this week, pick up a head of cabbage and let’s stir-fry! Oil: Avocado, safflower, or any high-heat friendly oil that you prefer. Steak: I used flank steak, but any cut that you prefer will do. Or you’re welcome to sub in ground beef. 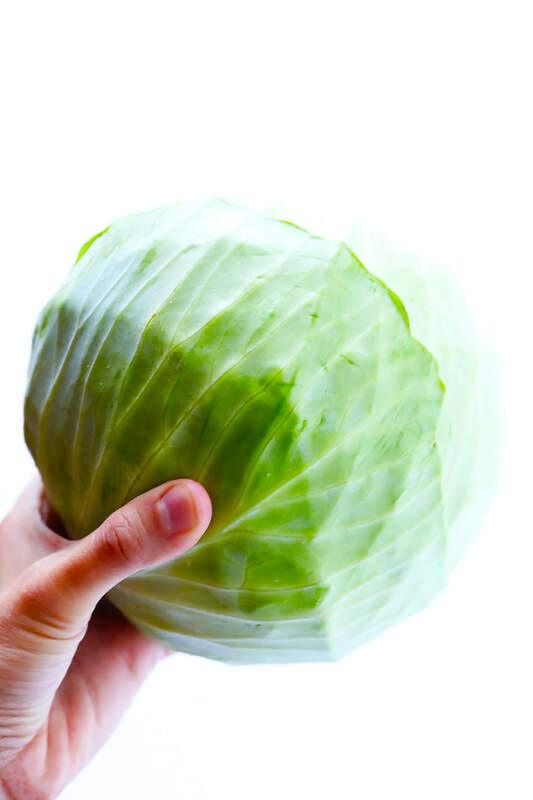 Cabbage: I used regular green cabbage, but savoy cabbage or bok choy would also be delicious. Veggies: Just onion (white, red or yellow), carrots (shredded or thinly sliced) and garlic. Sesame Ginger Sauce: We’ll just whisk together soy sauce, cornstarch, maple syrup, rice vinegar, chili garlic sauce, ground ginger and toasted sesame oil for an easy stir fry sauce. Toppings: Toasted sesame seeds and/or thinly-sliced green onions would be great, but they’re totally optional. Rice: I used brown rice. Noodles: My recipe for sesame noodles would be amazing with this. Quinoa: I always recommend cooking quinoa with vegetable stock (instead of water) for extra flavor. Any other grains that you might prefer: Lots of options! 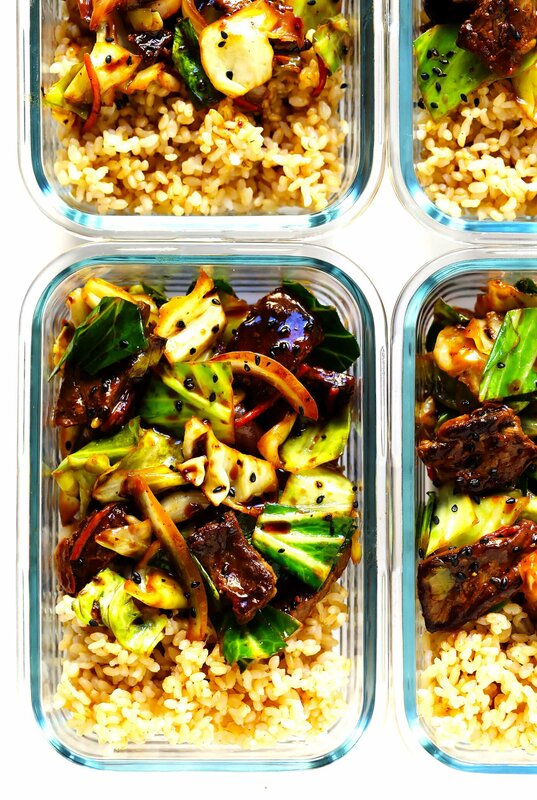 Make your stir fry sauce. Either whisk all of the ingredients together in a bowl. Or do what I do and shake-shake-shake them in a mason jar until combined. Combine everything. Add the cooked steak and sauce back in with the veggies, and toss to combine for about 30 seconds, or until the sauce thickens up. Season with additional salt and pepper if needed. Serve immediately. Over rice, noodles, or whatever you prefer. And sprinkled with whatever toppings sound good! Use a different protein: Chicken, pork, shrimp, or tofu would all be delicious replacements for the beef here. 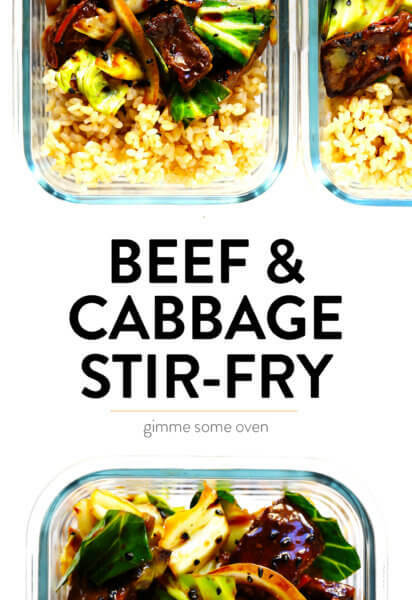 Use different veggies: Just about any stir-fry-friendly veggies would be a delicious addition (or substitution for the cabbage) in this recipe. 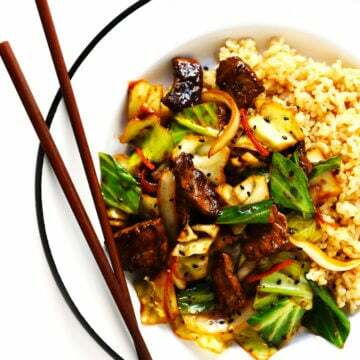 Use fresh ginger: I took the easy route with ground ginger in the stir fry sauce recipe below. But feel free to sub in about 1 tablespoon minced fresh ginger in place of the ground ginger if you would like. Make it milder: Just nix the chili garlic sauce altogether. Soup: Egg Drop Soup, Hot and Sour Soup or Miso Soup would all be delicious with this stir-fry. Extra veggies: Such as my Everything Roasted Asparagus or Miso Roasted Brussels Sprouts. Whisk all sauce ingredients together in a small bowl (or shake them together in a mason jar) until combined. Set aside. Season the steak with salt and pepper. Heat 1 tablespoon oil in a wok or large sauté pan over high heat. Add the steak and sauté for 4-5 minutes, tossing occasionally, until cooked through. Transfer steak to a clean plate and set aside. Add the remaining 1 tablespoon oil to the pan, along with the onion. Sauté for 4 minutes, stirring occasionally. Add green cabbage, garlic and carrots, and stir to combine. Continue cooking for 2-4 more minutes, or until the cabbage has wilted to your desired level of crispness. Add the cooked steak and sauce to the veggies, and toss to combine for about 30 seconds, or until the sauce thickens up. Taste and season with additional salt and pepper if needed. Remove from heat and serve immediately, garnished with your desired toppings. Or transfer to sealed containers and refrigerate for up to 4 days.